Basic Instant Pot Recipes at Your Fingertips! Never fumble around for cooking instructions again. It's all on this sheet, and you can download it for free. 5 of the most useful, economical, and easy pressure cooker recipes, all on one sheet! Download, print, and use any time you need to remember one of these "basic recipes." Includes instructions for hard boiled eggs, frozen chicken breasts, brown rice, baked potatoes, and dried beans. Download your cheat sheet now! 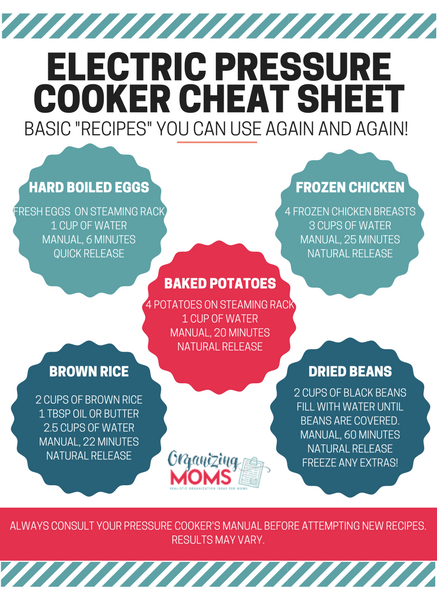 Get instant access to this helpful Electric Pressure Cooker Cheat Sheet when you subscribe to the Organizing Moms newsletter. © Copyright 2019 KMP Media LLC. All rights reserved.